Suction tension acts within the gas and liquid filled grain-pore-system in unsaturated fine grained soils and should partly control the shear strength. The development of pore pressure in a completely water saturated grain structure will reduce the shear resistance, whereas the suction tension within an unsaturated soil will cause additional grain-to-grain forces. These are changing with varying degree of water saturation and thus may influence the shear strength probably by favouring the formation of coarse grained aggregates. An experimental approach was started to investigate this expected relation in overconsolidated Tertiary clay and in Quaternary loess (silt) using triaxial and direct shear test results and comparing them with the results of suction tension measurements obtained by using pressure membrane apparatus. Based on the common classifications, one should argue that shear velocity will control the shear strength due to pore pressure effects in the shear zone. 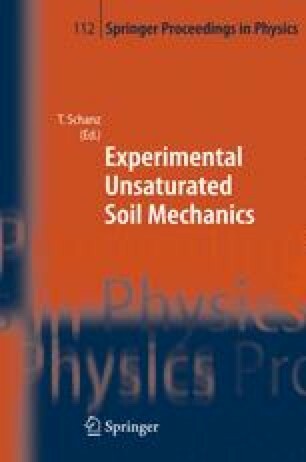 However, the antagonistic effects of overpressure of the pore fluid and compression of grains due to suction tension act on a micro-scale in unsaturated fine grained soils and influence the shear behaviour differently. Effects of suction tension are noticeable in triaxial and direct shear tests in unsaturated fine grained soils. Quantification is difficult because other stress influences like load level act more effectively.